This article is the third in a 3-part series. Also read about Day 1 and Day 2. This is it! The third and final day of our 3-day motorbike trip, and the one that ultimately convinced us to book this tour. Day 3 was billed as “DMZ day” where we’d travel near the demilitarized zone and visit military sights from the American War. Much like Day 1, however, the itinerary didn’t match the description on the tour website. After reading reviews of other DMZ tours (like this one), I think we hit some of the best sights (Khe Sanh Combat Base, Hiền Lương Bridge, and the Vịnh Mốc Tunnels) while skipping others with little to see (Dakrong Bridge, The Rockpile, and Doc Mieu Base). We had another 10-hour day, leaving Khe Sahn at 8:30am and arriving at 6:30pm in Huế, so we certainly couldn’t have seen it all – there are gobs of military sights in this area! I regret missing the Truong Son National Cemetery but Chris and I stumbled on a different national cemetery later in our travels. The hotel’s breakfast room, by far its best feature. Nice, but it didn’t quite make up for the giant cockroach in our room the night before – can’t stand those things! We started the day in Khe Sanh at the Khang Phuoung Hotel’s lovely sixth floor breakfast room where Chris bought Bằng’s meal; he owed him after losing the big foosball match the night before! The conversation turned to military service, and Bằng shared a little about his compulsory military training which sounds similar to a U.S. boot camp. Bằng only had to train for one month since he was attending university, and enjoyed it overall, mostly for the comeradery, staying up late playing cards, and getting yelled at to go to sleep. Ha! Boys will be boys. The small military museum at the Khe Sahn Combat Base. Very pretty setting. For our first stop, we motored 15 minutes north to the Khe Sanh Combat Base. There’s almost nothing left of the original base, but the site now has a small museum, reconstructed bunkers and trenches, ordnance displays, and captured American tanks and aircraft. I believe admission cost 40,000 vnd per person, but not sure since admission fees were included in the tour package. Display case in the Khe Sahn Museum showing a pair of Vietnamese sandals made from old tires. I’d read about these so often it was cool to finally see a pair! Bằng and Chris walking out to the C-130 at the Khe Sahn Combat Base. Though American military officials believed that Khe Sanh was a primary target, a full-scale attack never came. It’s now understood that Khe Sahn was a planned distraction, with the North Vietnamese concentrating their efforts on another surprise attack, the Tet Offensive. On January 31, 1968, ten days into the Battle of Khe Sanh, “…some 70,000 North Vietnamese and Viet Cong forces launched the Tet Offensive (named for the lunar new year holiday called Tet), a coordinated series of fierce attacks on more than 100 cities and towns in South Vietnam.” In the aftermath of the Battle of Khe Sahn and the Tet Offensive, anti-war sentiments mounted in the U.S.
A photo of a picture in the Khe Sahn Museum. The caption reads “US marines shutting themselves in bunkers for fear of their own shadows”. Not all captions were this mocking, but the language in Vietnamese military museums generally slammed previous aggressors (French, Americans, Japanese, Chinese, …) and exalted the ultimate winners (the North Vietnamese). The Khe Sahn museum, like many military museums we visited in Vietnam, had few English translations save captioned photographs, summary estimates of “decimated and captured” soldiers and “destroyed” military equipment, and grandiose quotes like the one from Ho Chi Minh proclaiming “Our victory in Khe Sanh has revealed the outstanding strategy and invincible strength of our army, people and cadres….” Patriotic displays tinged with self-aggrandizement were expected (the victor gets to write the narrative) as was the portrayal of American forces as aggressors (we were). Nonetheless, the derisive tone in a few photo captions was surprisingly hurtful, perhaps because I ache for all of the soldiers, Vietnamese and American alike, young men fighting a fight they didn’t ask for. Chris in the Khe Sahn Museum, switching things up to become a guide to our guide! Here they’re discussing the Tet Offensive. Outside, Bằng appreciated more details about captured aircraft. Though every military site visit was tinged with guilt for what the Vietnamese suffered at American hands, we valued and enjoyed seeing Khe Sahn. Bằng gave what history he knew and when we stumped him, he wandered away, researched on his phone, and returned with the requested information. As you might expect, the tables eventually turned with Chris going into full “Professor Brooks” mode. Chris is such a student of history, it was inevitable that he’d teach Bằng a thing or two. Fishing boats on a tranquil river. We are on a bridge on the QL15 just north of Highway 9 (aka AH16). Back on the motorbikes, we backtracked south to Highway 9 (labeled AH16 on Google Maps) and then drove east and north for close to three hours before reaching our next major sightseeing destination, the Hiền Lương Bridge. The drive was beautiful as always, winding through much flatter terrain than the past two days. In a pepper field. Not bell pepper or hot pepper, but the small round pepper that’s dried and ground in pepper mills. We stopped for river views, to sample fresh pepper pods, and to cool off with fresh-pressed sugarcane juice. We also made multiple stops at roadside stands and markets searching for Dragon Eyes; Bằng was determined to find us some, but struck out again and again. On the south side of the Hiền Lương Bridge looking north to the flagpole monument and museum. You can just barely see where the bridge paint transitions to yellow on the south half. As I mentioned earlier, the Hiền Lương Bridge on the Bến Hải River was a surprise stop and a great choice. Smack in the middle of the DMZ, the bridge stood as a symbol of the divide between North and South Vietnam and the struggle for reunification. Today two bridges span the Bến Hải River at this location: the smaller beam bridge built by the French in 1952 and bombed by the Americans in 1967, and a modern bridge constructed in 1996 (according to this article). Bằng relayed that in addition to the actual war (with troops and bombs and the like), three other wars were fought over the bridge: the Paint War (with each half repeatedly painted different colors), the Flagpole War (with each side erecting ever taller standards), and the Sound War (each side jockeying to have the loudest loudspeakers). Though we didn’t venture to the north side of the bridge to visit the flag monument or the 17th Parallel Museum, aka the Historical Museum of Relics, both are apparently worth a look with an elaborate mosaic on the flagpole’s base, racks of loudspeakers, and a museum filled with historic photos, statues, and dioramas that romanticize the war and celebrate the North Vietnamese victory. We visited similar museums on this trip so no great loss, but it’s on the list for next time! The impressive Reunification Memorial south of Hiền Lương Bridge. Near the south end of the bridge stands the Reunification Memorial, a gorgeous example of socialist realistic art. We saw sculpture like this throughout Vietnam: chunky grey statues with simple lines, idealized figures, and symbolism that glorifies communist ideals and values. In this one, coconut fronds frame a mother and child gazing towards the north and presumably yearning for reunification. After snapping our own pics, a couple of tourists asked us to pose in their photos. I never understood why folks wanted photos with us (Chris’s height? My red hair?) but it was always entertaining with lots of exaggerated smiling and gesturing and nodding. In this case, we’d had an animated conversation earlier with their guide, a Vietnamese who had studied in Cuba and had a brief back and forth with Chris in Spanish. Who would have thought?! Walking the grounds at the Vịnh Mốc Tunnels, located right on the coast and well positioned to resupply troops on a nearby island. Next stop: The Vịnh Mốc Tunnels (~40,000 vnd admission) 20 minutes north of the Hiền Lương Bridge. I loved this place both for its fascinating history and the 1/2-mile of underground tunnels to explore. If you need to let your inner child run free, wear good shoes and bring a flashlight; the tunnels are generally decently lit with solid footing, but some areas can be dark, steep and slippery. We stuck to the main, well-traveled tunnels with Bằng in the lead, but there were loads more that looked inviting and more adventurous. Kids would have a ball here! Of course we also lucked out and had the place practically to ourselves, arriving at 1pm on a Saturday in mid-April. In the Vịnh Mốc tunnels with Bằng. You can see a guy at the far end – that’s a statue! This is pretty typical of the tunnels we explored with a flat sandy floor, and decent lighting with patches of darkness between lightbulbs. Our phone flashlights came in handy a few times. Two communities in the Vịnh Mốc area (Son Trung and Son Ha) took a serious beating during the American war. 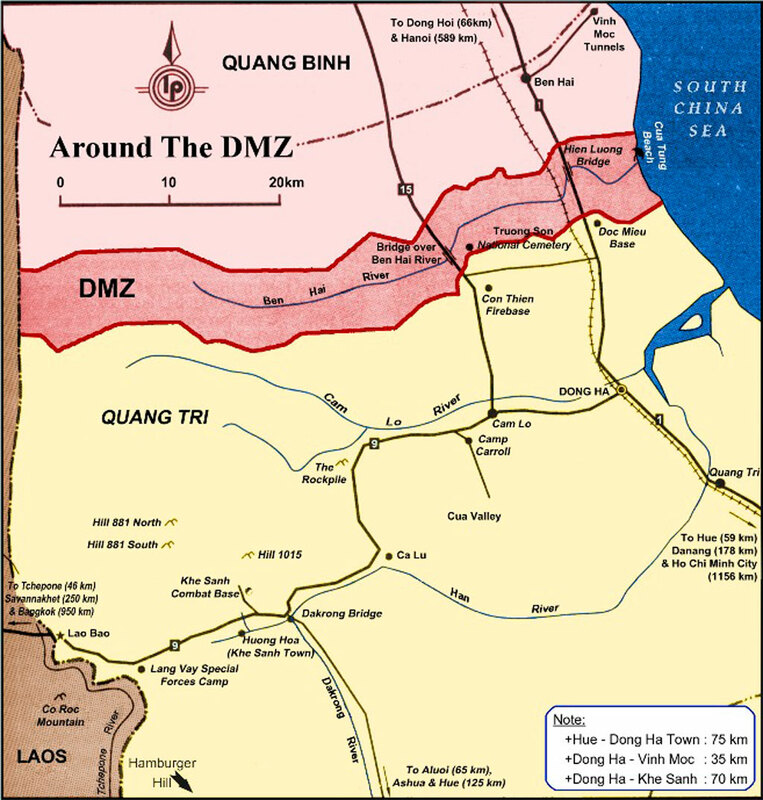 Due to their unfortunate location just north of the DMZ, and the belief that they were supporting North Vietnamese troops on nearby Con Co island, their towns were repeatedly bombed and destroyed. Did they abandon ship? No! They dug in – literally – building a vast underground system of tunnels. Used from 1965–1975, the tunnels eventually spanned three levels with most 25–50 feet underground, and the deepest reaching 75 feet; they expanded downward out of necessity after Americans developed bombs that could burrow 30 feet deep. The Vịnh Mốc tunnels sheltered about 300 villagers and contained living spaces, bathrooms, kitchens, hospital rooms, a meeting room, weapons storage, wells, and ventilation shafts. Incredibly, in the 10 years spent underground no villagers died and 17 babies were born. Walking the grounds, I was once again blown away by the Vietnamese people’s grit and determination. What an achievement! A map of the Vịnh Mốc Tunnels from the on-site museum – very helpful to see the full extent. Levels are color-coded and rooms labeled. We started above-ground with the museum which again had few English translations, but still gave a nice overview. Captioned photos and a large tunnel map were particularly helpful, and we learned that the villagers did indeed provide food and supplies to the garrison on Con Co Island. At entrance #6 (of 13) to the Vịnh Mốc Tunnels. The grounds and tunnels were surprisingly quiet with few tourists about which reinforced our previous decision to skip the more popular (and much more touristy) Cu Chi Tunnels north of Ho Chi Minh City. From what we could gather, the Vịnh Mốc tunnels are similar to those at Cu Chi but bigger so easier for gangly westerners to walk through. The Vịnh Mốc tunnels are isolated, though, unlike the Cu Chi tunnels which were part of an extensive network of connected tunnels used by Viet Cong fighters for myriad purposes including communication and supply, food and weapons caches, and surprise attacks. We ate lunch right outside the main gate, with Bằng ordering a huge family-style meal while other tour groups dined on simple fried noodles. Thank you Bằng! A caged Myna bird kept us company along with the requisite chickens and dogs, and though he mimicked a few sounds and whistles, the stubborn bird simply refused to talk. Maybe we should have tried feeding him – Polly want a cracker? In a red pepper field. This woman was very nice, chatting with Bằng and generally laughing at us. Note the temples in the distance, a tiny fraction of the many we saw. The afternoon drive held yet another scenery change transitioning to vast, open spaces covered with flat farmland. People dotted the landscape, working the fields by hand, alongside buffalo and cows lazily pulling carts. We stopped a few times, once hopping into a red pepper field, and later to watch a man electrifying a small pond to catch fish (!). We must have passed a zillion temples, each one family-owned and used on special days to gather extended family together to honor ancestors. Working hard to bring in the day’s catch. With the sun shining and food coma setting in, we searched for a beach rest stop eventually lucking upon a lovely spot bustling with fisherfolk. Boats had recently pulled in with the day’s catch and people hustled about offloading, bagging and weighing, cleaning nets, and generally tidying up. While Chris and Bằng took cat naps, I walked the beach and ended up in another extensive photo session with four adorable Vietnamese teens posing with me in every permutation imaginable – hilarious! Chris joined me on the beach and we walked a bit more before reluctantly mounting up and hitting the road. The lovely sunset view at our final stop north of Huế. The road turned quite rough with potholes, but Bằng rarely slowed or stopped which was unusual. We soon realized why he was in such a hurry: it was a race to reach our final destination for the day, a viewing tower set in a serene estuarial area north of Huế. Bằng delivered us in the nick of time! We reached the top of the tower just moments before the setting sun dipped out of sight. Gorgeous, and so typical of Bằng, going to great lengths to share special experiences. Looking down at Bằng from the top of the viewing tower. Note how narrow the path is – tricky driving for inexperienced motorbikers! Chris felt the drive through the estuary was his final exam given the elevated narrow road (just a few feet wide!) that wound through trees and turned sharp corners. I was nervous as his passenger (!) but Chris passed with flying colors, guiding us through without incident. Success! Bằng finally found Dagon Eyes (aka Longan). This little fruit tastes like a cantaloupey grape. It was the perfect end to the perfect day, or three days really. From there, we had an easy ride into Huế, stopping one final time for Dragon Eyes – success at last! Bằng delivered us to our hotel, the Rosaleen Boutique where we settled up and said our goodbyes. Parting was bittersweet; we were ready to take a break from motorbiking, but would miss the freedom and time with Bằng. Truly, the trip wouldn’t have been the same without Bằng’s friendly, adventurous nature and his dedicated mission to share his Vietnam. The trip may not have strictly followed the website itinerary, but at the end of the day, we experienced so much more than expected. Our last selfie with Bằng. Thank you Bằng, we’ll miss you! Would we recommend Phong Nha Motorbike Tours? Absolutely! It was a huge splurge costing $195 per person, but worth it (to us). If you’re an adventurous traveler and experienced on a motorbike, you could certainly do this trip on your own for a fraction of the cost, but we valued the information shared by our guide (Bằng) and needed the time to brush up on the ins and outs of biking. If you book a tour, be sure to confirm the itinerary in advance and also discuss with your tour guide before setting out each day. Be open to suggestions, though. With Bằng’s guidance we ended up in more interesting spots. Also remember to pack sunglasses (or clear safety glasses for night driving), long pants, and a lightweight long sleeved jacket to protect against the sun and road grime. Bằng carried waterproofs (for us all) in case of rain. Many Vietnamese wear face masks while biking and by the end I wanted one, especially the closer we got to Huế where the open burning increased; the combination of smoke and exhaust grew overpowering at times. Waiting for lunch and a typical scene: wiping the grime off, sitting in plastic chairs, guzzling water, and cooling off with the help of a small fan. It’s certainly not the lap of luxury, but we loved every minute. Because of this tour, we fell in love with motorbiking and ended up renting on our own in Huế, Hội An, and Cát Bà Island. Many of my favorite memories of Vietnam were etched while sitting on the back of a bike, which is pretty remarkable considering my risk averse nature and lifelong aversion to motorcycles. It almost became a mantra though: when in doubt, rent a bike! The freedom is exhilarating and makes even mundane travel feel adventurous. Along Highway 9, labeled the AH16 in Google Maps. Fresh pressed sugarcane juice was a refreshing treat on a hot day! A colorful Vietnamese boat. Love the eyes!